Salmon are moving upstream to spawn and the upcoming weeks and months can provide world-class fishing in Michigan’s rivers and streams, particularly for salmon and steelhead. If you’re on the water, the Michigan DNR asks you to remember to take necessary precautions to prevent the spread of New Zealand mudsnails, an invasive species in Michigan since 2015. 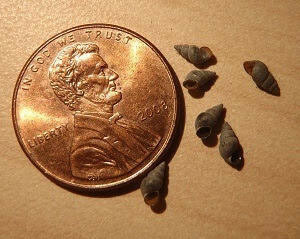 At about only one-eighth of an inch long, a New Zealand mudsnail can be difficult to see. However, these snails can radically change the aquatic habitats they live in by reaching very high densities. When that happens, they can out-compete native species that are important food sources for trout. They also have no nutritional value for fish that do feed on them, and that can negatively affect overall fish health. Since the initial report in 2015, New Zealand mudsnails have spread in Michigan and now are found in the Pere Marquette, Boardman, Au Sable and Upper Manistee rivers, as well as Tippy Dam Pond near the Pine River. Herbst said it’s critically important to properly decontaminate gear and equipment to protect other streams from this invader. After fishing, clean, drain and dry equipment to help prevent the spread of these invasive snails and all types of aquatic invasive species. Soaking gear and equipment with a Virkon Aquatic or Formula 409 solution – Oakland University research showed that Formula 409 is effective at killing New Zealand mudsnails – is recommended, but simply allowing equipment to dry or freeze for at least five days before reusing is effective for decontamination.